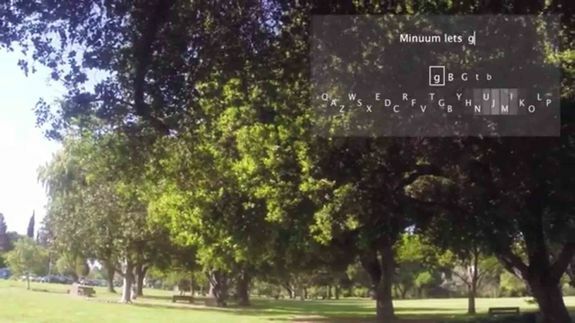 Minuum announced plans to bring its super-tiny Android keyboard app to a new platform: Google Glass. The company revealed two ways a keyboard app could work on Glass, and teased three different keyboard concepts that could potentially work on Glass or future wearable devices. The app, which is not yet available to Glass owners, allows users to input text through two methods: by using Glass' touchpad, or through small head movements tracked by Glass' sensors. "Your typical augmented-reality headset is equipped with at least a small touchpad, a motion sensor and a camera," co-founder Will Walmsley said in a blog post. "We’ve worked with Google Glass for a few months now, and have built versions that let you type either using the touchpad, or by detecting subtle head movement." Minuum also showed off three keyboard concepts that could be integrated into future wearable devices, including eye-tracking, ring-enabled gestures and projecting keyboards onto your hand, arm or other surface. Minuum is a Y Combinator-backed company that demoed its Android keyboard app at the incubator's most recent demo day. During his presentation, Walmsley touted the app's potential to bring "delightfully fast sloppy typing" to wearable devices with tiny screens, such as smartwatches. Previously, the company raised more than $87,000 through crowdfunding site Indiegogo to develop its Android keyboard app, which squeezes a full keyboard into the very bottom section of a handset's screen. Minuum's app is not yet available for Google Glass, although its Android version is available in Google Play.